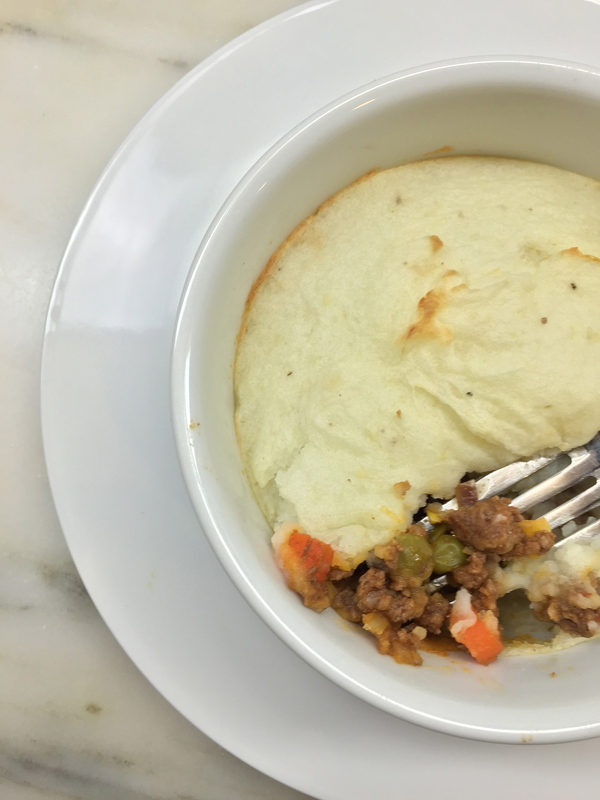 This simple and tasty shepherd’s pie was adapted from Real Simple’s “Easy Shepherd’s Pie.” I used organic ingredients and added some onions. The organic ground beef was bought at a reasonable price at Costco and it’s only 10% fat! In a nonstick frying pan, cook ground beef over medium heat, until meat is no longer pink. Drain fat and set meat aside in a medium bowl. In the same pan, sauté onions. Return meat to pan. Stir in ketchup and Worcestershire sauce. Add vegetables, then add salt and pepper to taste. Cook for about one minute, add water and stir. Spoon mixture into 4 ramekins (5” in diameter). Spread mashed potatoes over mixture. Bake for 15 to 20 minutes, until potatoes get slightly brown. Serves 4.